Dive into a world of stories! Manga has made waves in the comic industry worldwide. With their distinctive styles and broad range of topics and genres, there's sure to be a manga for everyone. While the most famous mangas are often shonen (boys') and shoujo (girls') manga (i.e. Naruto, One Piece, Sailor Moon, and Cardcaptor Sakura, to name a few), that doesn't mean that there aren't mangas targeted for more adult audiences (these would be seinen for men, and josei for women). There is no limit to the kinds of stories mangas can tell, from hilarious comedies, stupefying sci-fi, and tender romances, to heartbreaking tragedies, adrenaline-fueled action, and terrifying encounters. Want the best deals for your manga? 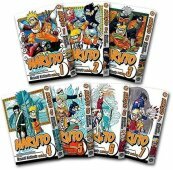 Check out our offers and find your manga today!